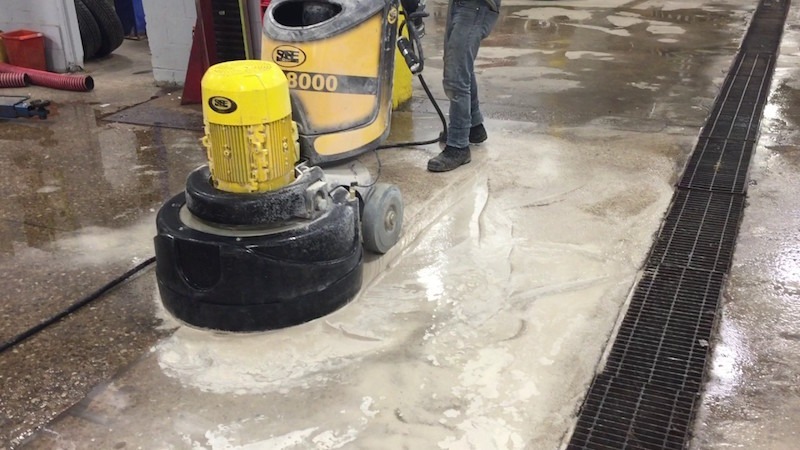 Concrete grinding and polishing can seem a bit daunting for those that are not used to the tools. If the work is carried out incorrectly can do permanent damage to your surfaces. However, whether you experienced contractor or attempting some home DIY, if you follow a few simple steps you should be able to carry out the work without any major mishap. And that’s what this short guide is all about. Tip 1: The experts like to use play sand, there’s no reason you shouldn’t too. Play sand works as a great abrasive when you are using a concrete grinder. Not only does it help keep the grinding disc dressed and cooled it also acts as a secondary abrasive to speed up the grinding process. Having some play stand available throughout the job is always a good idea. If you notice that your tools performance is slowing down halfway through, applying a little sand can make a difference. Often times the tool will have heated (the matrix may have also started to swell), the sand will increase the amount of debris in the work area, which in turn will help expose new diamonds for grinding. In short, the play sand will help ensure you have a constantly dressed tool working at peak performance. Most yellow and white carpet adhesives on the market are water based. If you presoak the material, you will actually rehydrate the adhesive which leads to swelling. This swelling process will result in the material debonding from the concrete. The end result? A whole lot easier for you to remove. You should only use enough water to soak in and rehydrate however. If you go over board and are too liberal in your approach, the material will spread on the surface and dry. Another benefit of presoaking the material is that it will keep your tools cooler as you work. If the carpet adhesive is blue or green, it is likely to be epoxy- or urethane-based. In this case you should use play sand instead of water. If your tool has a “rotation” button, you should periodically use it, (head here for some in depth reviews of top rated concrete grinders). This action will actually redress a diamond that has a direct wear pattern. It will also help cool stones, which will result in a different leading edge. If you are grinding soft, porous concrete, rotating your machine will help as well. In essence you are changing the surface of the tool, which will help longevity of performance. You should always make sure that the water or air channels remain open whenever you are wet-cutting with a transition tool or resin. If things get clogged when you are doing this type of work, the built-up slurry will result in an irregular scratch. If the water channels are open the slurry will have an escape route, leaving things clear in the work area, (and a path for any debris to escape). Open channels will also ensure that everything is working at the proper temperature, (i.e not too hot). Finally, you should never run a dry-only pad wet. But you already knew that. Tip 5: Presoaking an extra tough trowel slab will make grinding easier. The presoak will help reduce surface tension as well as flush small aggregate and sand to the surface. These will act as a secondary abrasive (as in tip one, a bit of play sand can make things easier); roughing up the diamond matrix to help grinding efficiency. Again temperature regulation will also be better, with the presoak cooling things down before you begin.